At Irish Cancer Society the Paint It Pink coffee morning were, from left: Eileen King, Chriss Griffin, Mary O’Halloran, Maureen Roche, Pat Flaherty. Photo by Gavin O’Connor. Local members held a coffee morning in Kirbys Brogue Inn on Friday morning which included prizes along with plenty of chat for a vital cause. 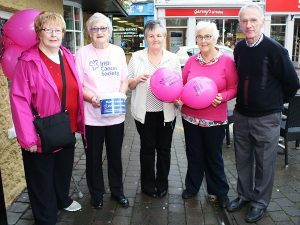 The charity group are appealing for volunteers and people to host other coffee mornings for the ‘Paint it Pink’ month. Funds raised will go towards ongoing research into breast cancer with ultimately aim of finding a cure. One in 10 women in Ireland will get breast cancer at some stage in their lives. Around 2,600 women are diagnosed with breast cancer and 660 women die from the disease. It is most common in women over the age of 50, but you can get it at a younger age. Men can also get breast cancer but it is very rare.